Devils Tower National Monument is located in Wyoming USA! This is my list of travel tips and things to do like climbing, hiking, road trip ideas and even Close Encounters of a Third Kind! What are you waiting for? It’s time to start planning your trip to Devils Tower, America’s first National Monument. 100 miles northwest of Rapid City and the Black Hills it is well worth taking a side trip to Devils Tower. The tower rises 1,267 feet above the Belle Fourche River, standing 867 feet from summit to base. This huge rock structure has awed humans for years! Native Americans had many names for the formation including Bear Lodge and Tree Rock. They thought that the vertical fissures in the rock often resembled bear claw marks. It is believed the English name of Devils Tower came from the mistranslation of the American Indian term which was loosely translated to bad gods tower and then changed to devils tower. When you are staring up at the tower it is hard to believe it is real and I always wonder how in the world did it end up in the middle of Wyoming. While most people believe it was caused by a volcano it is actually a formation called an igneous intrusion. Around 60 million years ago, magma forced its way up through layers of sedimentary rock but did not reach the earth surface. As the magma cooled it shrank and cracked. Over time erosion wore away the sedimentary rock exposing the igneous rock formation. Shortly after entering the park you will run into a Prairie Dog Town. 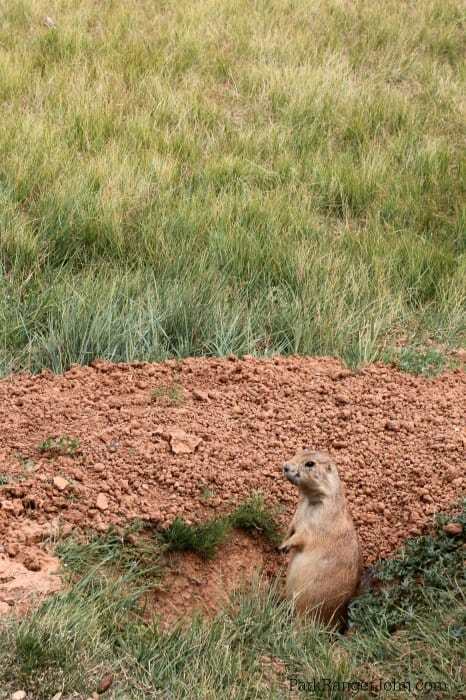 Here you will find several Prairie Dogs that seem to wait to pose for you! From here you can continue driving towards Devils Tower or take one of a few trails including the Valley View Trail, The South Side Trail, and the Red Beds Trail. The next stop is at the day use area and the Belle Fourche River Campground. Make sure to take time and visit this area and visit the sculpture named Circle of the Sacred Smoke. World Renowned sculptor Junkyu Muto created this sculpture. 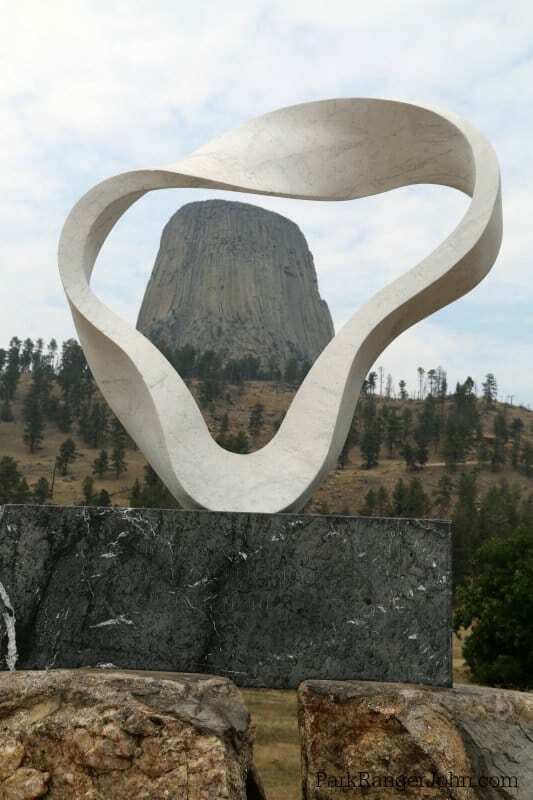 It is the third of seven sculptures around the world designed to help raise visitor awareness of the importance of Devils Tower to over 20 affiliated tribes. Continue up and take a left to go to Joyner Ridge Trailhead. This is a great trail to view Devils Tower at a distance. You may also see prayer bundles and prayer cloths along the way. Remember that Devils Tower is a sacred site for many Native Americans. What I really like about this trail is that it crosses over several ecosystems on a short 1.5-mile hike. After taking a nice hike on the Joyner Ridge Trail, continue up to the top parking lot. Remember that this is a very popular park and unless you get here early you may end up hiking a distance to get to the visitor center. Make sure to take the 1.3 mile Tower Trail that goes all the way around the monument. We thoroughly enjoyed watching the climbers going up to the top of the monument. Devils Tower is one of the finest traditional crack climbing areas in North America! There are hundreds of parallel cracks with varying lengths including the longest at almost 400′ long. Click here to visit the National Parks page for regulations, closures, routes and climber registration. Bring your binoculars and watch the rock climbers work their way up Devils Towers rock formations. Camping is a great way to wake up with a view of the tower and be right in the park. 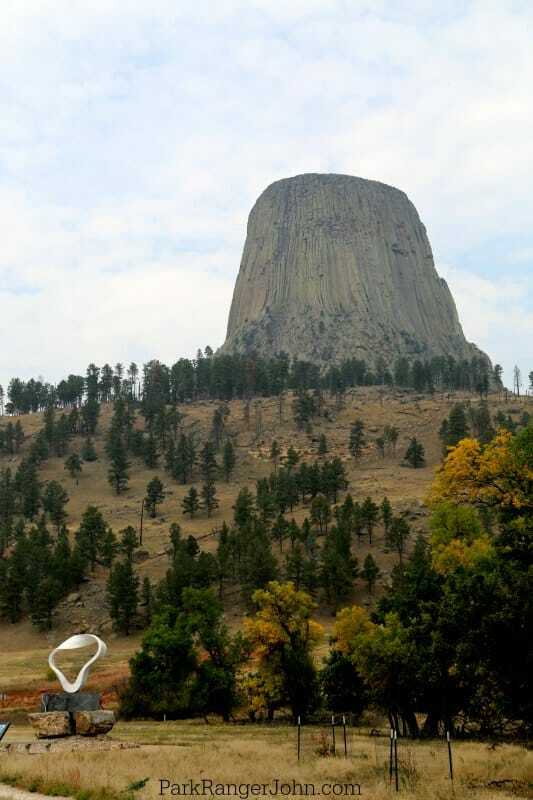 Check out our entire post on Devils Tower Camping for more information on the campground and what to expect. From the east or west, take US Hwy 14 to WY 24 (follow the signs from I-90). If approaching from the north, take WY 112 to WY 24 (from Montana) or SD 34 / WY 24 (from South Dakota). What are the hours for Devils Tower? Devils Tower National Monument is open 24 hours a day, 7 days a week and every day of the year. 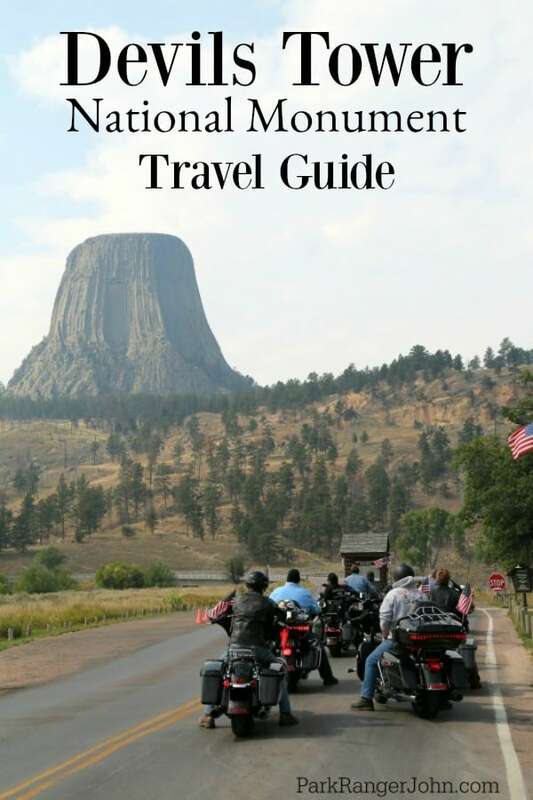 What does it cost to visit Devils Tower? $40 Monument Annual Pass (good for one year from purchase date for pass holder and all vehicle occupants). Annual pass covering the entrance and standard amenity fees for national parks and other federal fee areas. This replaces the National Parks Pass and Golden Eagle Pass. Interagency 4th Grader Pass: Free – Available to U.S. 4th Graders (including home-schooled and free-choice learners 10 years of age). Valid for the duration of the 4th grade school year through the following summer (September to August). Lifetime admission and discount pass for US citizens or permanent residents with permanent disabilities. $80 – Lifetime admission and discount pass for U.S. citizens or permanent residents who are age 62 and older. $20 – Annual admission and discount pass for U.S. citizens or permanent residents who are age 62 and older. Other fees such as reservation, camping, lodging, tours, concession and fees collected by third parties are not included unless stated otherwise. How tall is Devils Tower? Devils Tower is 867 feet from its base to the summit. 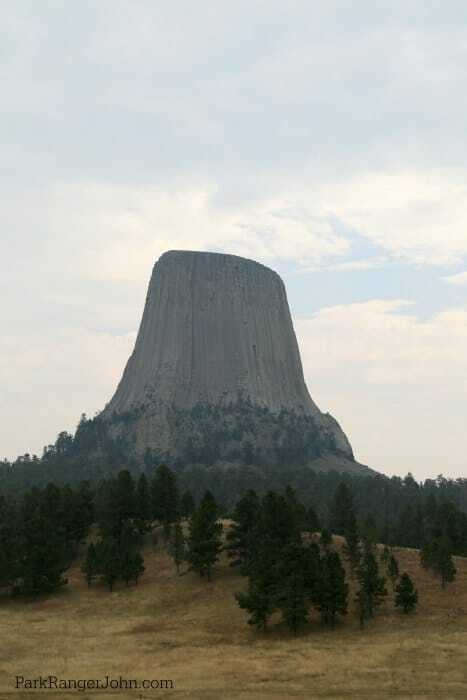 How far is it around Devils Tower – It is 1 mile around, though the trail is 1.3 miles around the base. President Theodore Roosevelt designated Devils Tower as America’s first National Monument in 1906.